Few things make my life more interesting than little quirky streets that carry with them a lot of history. In this case, El Paseo del Chorro (and la Bajada del Chorro) in San Miguel de Allende (Guanajuato) are part of San Miguel de Allende’s history and folklore. When I visited, I was surprised to find women washing clothes in little basins, much like they must have done in more ancient times. Apparently washing clothes in El Chorro is quite a common tradition, as per this little tidbit. Originally, Fray Juan de San Miguel and the Franciscans built a chapel near the railroad station and a small pueblito (village) formed around it. They named it San Miguel – today the area is known as San Miguel Viejo. Another monk of the time of Fray Juan de San Miguel, Fray Bernardo Cossin moved to higher areas of San Miguel, where a spring was providing fresh water. This area is known today as El Chorro. You may see on certain days women washing their cloth there. At the same time El Chorro serves also as an exhibition place for artists and their works. 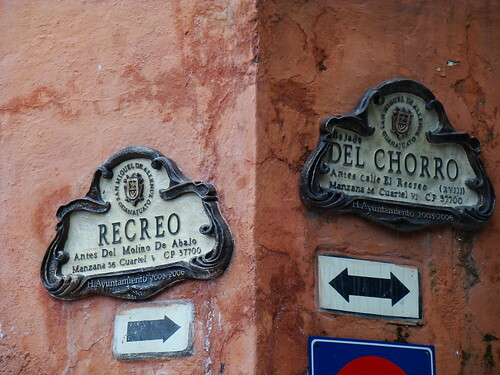 From what I read on this blog post, apparently there is a park built around it (Parque del Chorro). Chorro Parque is built around one of San Miguel’s most winding streets. This small peaceful park climbs up to the natural spring and church located at the top of the hill. Historical accounts published on the Lonely Planet guide indicate that El Chorro played quite an important role in the founding and development of San Miguel de Allende. The town, so the story goes, owes its founding to a few over-heated dogs. These hounds were loved by a Franciscan friar, Juan de San Miguel, who started a mission in 1542 near an often-dry river 5km from the present town. One day the dogs wandered off from the mission; they were found reclining at the spring called El Chorro. The mission was moved to this superior site. You can read a little bit more about El Chorro on this page (in Spanish). 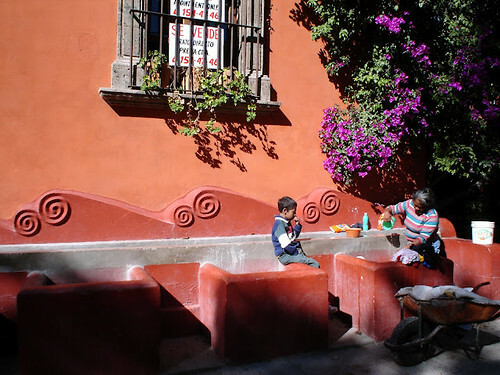 I seriously need to come back to San Miguel de Allende to visit more and showcase it for my readers. Doing the WeVisitMexico Puebla Tweetup press trip really peaked my interest in showcasing Mexico and many other countries I’ve visited and lived in.